Our research covers two general areas of inquiry, both under the broad spectrum of land-atmosphere interactions. The first of these focuses on (1) utility of numerical models (e.g., the Weather Research and Forecasting System) and data (e.g., satellite data and in-situ weather observations) to examine process-driven impacts on climate and hydrology associated with urban expansion, urban adaptation and mitigation. In addition, our accounting of multiple scales of forcing (e.g., local/regional built infrastructure ranging to scales associated with greenhouse gas induced climate change) allows us to examine impacts and solutions to urban sustainability that account for the totality of anthropogenic effects while being locally specific and geographically relevant. The impact of urban environments on rainfall is a key scientific question of high import for urban planners, water resource managers, and stakeholders. 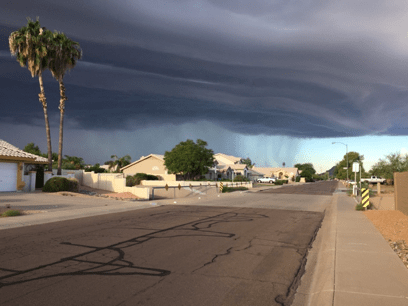 The image above shows a squall-line moving through the Phoenix metropolitan area in the summer of 2016. Photo by Matei Georgescu. The second of our general areas of research focuses on (2) utility of numerical models (e.g., the Weather Research and Forecasting System) and data (e.g., observed representation of crop phenology) to assess implications associated with large-scale bioenergy crop expansion (e.g., miscanthus and switchgrass). These crops, essentially giant grasses that modify energy receipt at the surface of our planet may modify regional water cycles depending on the replaced land use/land cover. Consequently, our focus on sustainable deployment of this potential energy resource is restricted to abandoned and degraded farmlands over the US, cerrado areas of the Brazil, and rapidly deforested regions of Indonesia. UWIN is multi-institutional partnership led by Colorado State University (PI: Mazdak Arabi) focused on the creation of knowledge to increase understanding of challenges to urban water systems. UWIN is a multi-institutional partnership whose core goals include the discovery of solutions to enhance preparedness for responding to water crises in regions across the United States. The National Science Foundation (NSF) funded project is composed of four separate thrusts, intimately connected to better understand past, baseline, and projected hydroclimatic conditions that are expected to significantly pressure existing water use within urban regions. 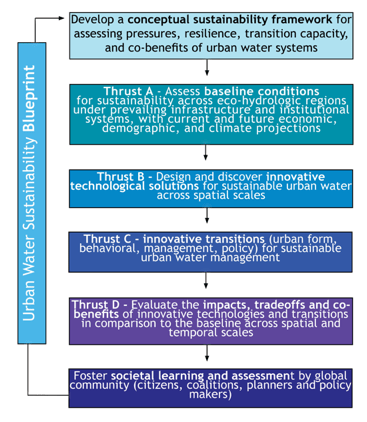 In addition, to an assessment of hydroclimatic conditions, researchers are focused on the design and discovery of innovative solutions that are locally relevant, societal transitions necessary for sustainable urban water management, and evaluation of impacts, tradeoffs, and co-benefits associated with various technological choices. Societal learning through citizen science is a fundamental outreach activity aimed to communicate our scientific community with planners, managers and a variety of stakeholders. Key Result: Regional climate model simulations have demonstrated that urban induced warming is of a similar order of magnitude as that due to largescale greenhouse gases (during the summer season), on the scales of individual megapolitan regions. Although impacts are uniquely determined by urban expansion and global emissions pathways, it is important to recognize that research to date has assumed these important forcing agents act in a linear fashion. This may or may not be true, and Dr. Scott Krayenhoff is currently addressing this key question utilizing a suite of regional climate model simulations driven by a suite of Global Climate Models. In addition to the interaction between the urban scale and larger scales, an additionally fundamental question relates to the potential to reduce these impacts via commonly proposed strategies (e.g., cool and green roofs) and the uncovering of potential nonlinearities associated with them. Tackling twin concerns of energy security and anthropogenic climate change are principal factors for the continued pursuit of renewable energy in the US and across the globe. Indirect and unintended detrimental consequences related to climate and food security for first generation bioenergy crops exemplify a non-sustainable approach to bioenergy production. Similarly, land-use change (LUC) associated with perennial biomass energy expansion may have significant and direct effects on natural water resources that requires assessment prior to large-scale surface modification to ensure long-term environmental sustainability. The ASU WSC project uses a trans-disciplinary framework integrating across physical (i.e., coupled hydro-climate), agricultural (i.e., crop modeling), and socioeconomic (i.e., economic) elements to develop regional “hot-spots” of sustainable perennial biomass energy expansion on U.S. degraded and abandoned farmland, and regions across the world. Biofuel crop suitability for (a) contiguous United States using a quantile classification. Unsuitable locations are displayed in gray, while low and high suitability locations are displayed in red and green, respectively. Potential perennial biofuel deployment for (b) 100% deployment scenario [all suitable classes presented in panel (a)] and (c) 25% deployment scenario (only very high suitability shown in green). The black box shown in (a) is the domain illustrated in (b) and (c). Wang et al., 2017; J. Climate). Assess impacts on perennial biomass energy crop yields over the geographically explicit sustainable regional “hot-spots” determined above. In addition to quality of land, alteration of temperature, precipitation, and downwelling solar radiation will modify the daily photosynthetic production of biomass. Assess economic profitability of growing perennial biomass energy crops in identified “hot-spot” areas and quantify market share of production in those areas.